A storm came loudly at 3:15 a.m., wind and hard rain hitting in an instant. It settled quickly into a steady rain that continued as we awoke for the day. 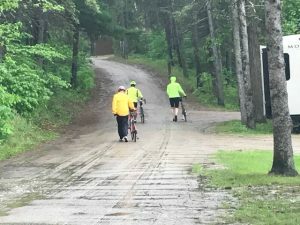 While we ate our egg bake and strawberries and looked at the forecast for the day, Brian innocently asked, “Hey Dennis, what’s the chance that we’ll get a weather window?” Everyone got a good laugh out of that…not very likely to get a 5-hour window on a day showing 90% chance of rain all day long. Slim and none are the two chances, as an old college professor of mine used to say. Sherry was not feeling well at all this morning, so John decided to drive her back to Bloomington, where she would be more comfortable. Was it me, or did John seem awfully cheery as he departed in Doug’s truck, knowing he would miss a day of riding in the cold rain? After John left, we actually had a long talk about our obligations on the ride. We don’t think that anyone is expecting us to endure a totally miserable day in awful weather conditions if we are not up to it. Kathy was particularly concerned about this; a rainy day with highs in the 50’s is not a healthful day for biking. After more discussion, Doug volunteered to ride in Kathy’s place if Dennis and Brian were still willing to ride. Party on! 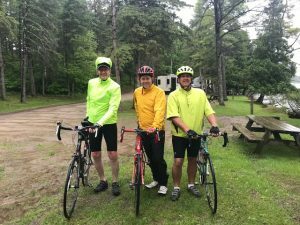 We kept checking for weather windows on radar and saw that one might be developing in Park Rapids in about an hour, so we got dressed up in our available rain and cold weather gear. 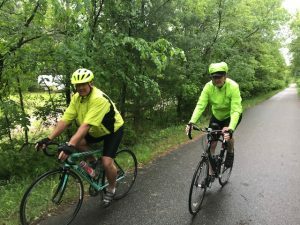 Doug hasn’t ridden a bike in nearly 15 years and has never ridden with clips, so we gave him a quick lesson and a few pointers, and we headed west again on the Heartland Trail. Doug’s a quick learner, and he seemed to adapt fairly quickly to the new challenge. We rode the 19 miles to Park Rapids in a steady rain, and we still found no window. We all met near a park pavilion, rode into town and refueled with snacks at the Food Mart. While we were dawdling in Park Rapids, the window finally came, and we quickly jumped back on our bikes for the ride back to Akeley. Unfortunately, we had now picked up some wind to replace the rain. We rode back to Akeley without incident. Dennis had phoned ahead to Kathy, requesting delivery of a peanut butter sandwich. He did not want to ride down to the warmth of the campers and then try to leave again. Kathy took the support role to a new level with this delivery service…other support drivers better take notice! At Akeley Doug decided he had done enough, nearly 40 miles in a relief role. Kudos to him for stepping in! Another support driver first! Brian also decided to call quits when he reached Akeley, although very, very reluctantly. His hands were numb from the cold, and he could not seem to stay warm. The hot showers were calling to him, and nobody in our group was judging. Dennis quickly ate his delivered lunch, got some encouragement from Kathy, and started down the trail again, 24 miles to go. It was more of a mental challenge than physical for the last hour and a half, as each mile marker ticked slowly past. Finally he made it to the finish line, and he joined the rest of the group at the campground.